The Blackberry epidemic has reached its peak. Blackberry is now a must-have even to the laggards, and those most resistant to change. Displaying the power of social pressure and tapping on the need for social belonging, Blackberry has managed to become number one, despite no major advertising efforts, only good PR and amazing word-of-mouth, following consumer satisfaction. A year after its introduction through the MTC services, and after Alfa's adoption of the Blackberry services, Blackberry has become an awesome success story. A market loss for iPhone; which, although they previously had the upper hand, given apple's brandname, until this day, need to be cracked. This translated on the ground with a complete shift to Blackberry. With its first mover's advantage, and Nokia E72 's "follower" strategy, competing over cost leadership ($10 for the Nokia E72 services versus $45 for the Blackberry services in Lebanon), Blackberry is sure to stay in the lead for a while. Especially considering the high switching costs in view of the popularity of the BlackBerry messenger and the spread of Blackberry's presence in Lebanon. 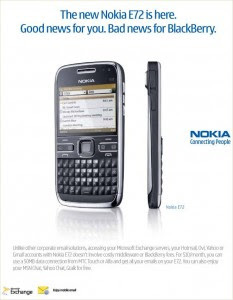 A beautiful but ineffective advertising campaign conducted by Nokia for its E72 phone says" the Nokia E72 is here. Good news for you. Bad news for BlackBerry." A powerful message. However, word-of-mouth is stronger and more credible than advertising. Good news for BlackBerry, bad news for Nokia. - Easier to type with a full, physical keyboard than the iPhone's onscreen keyboard. Few people here are willing to get used to the virtual keyboard. - Blackberry's Messenger, an instant messaging service integrated with BB phones, that doesn't need the Internet to work and is free and unlimited. That's enough to make a Lebanese texter drool! - BB phones are officially sanctioned in Lebanon, the service is legitimate, and full support is provided. The iPhone on the other hand is not officially released here, it has to be hacked in order to work in Lebanon, costs an arm and a leg, and you can't expect repairs and tech support from Apple. Also, the device is crippled in Lebanon by our weak telecom infrastructure, as well as the inability to use many of the phone's applications because they are designed with the USA in mind. I agree, it's a good analysis of the Lebanese users choice of Blackberry.